Conserving freshwater is one of those seemingly constant struggles, especially with a human population exceeding seven billion. In the United States, between 80 – 90 % of freshwater is consumed by agriculture, making it the perfect industry to implement more efficient ways of using water! Installing a soil moisture sensor is one way to optimize irrigation systems and reduce water consumption. 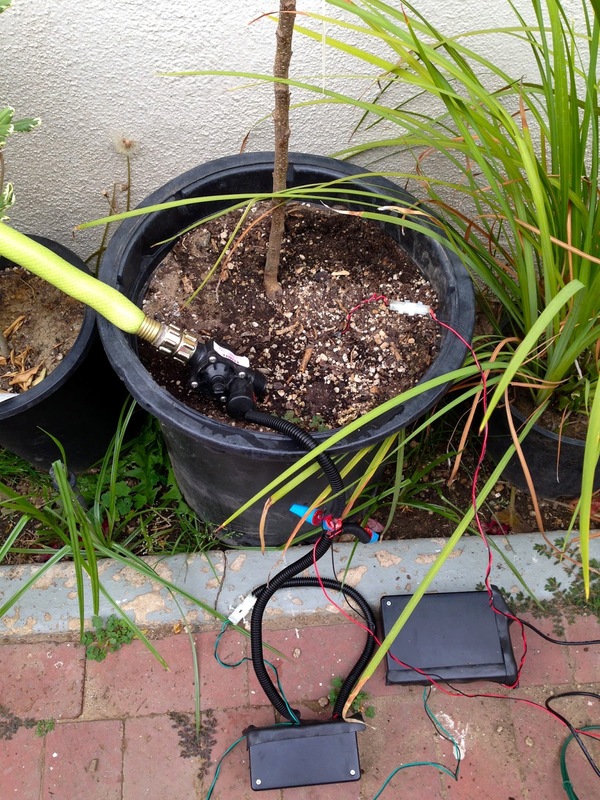 Soil moisture sensors measure the amount of water in the soil so that your plants get water only when needed. The following tutorial is a simple capacitive soil moisture sensor that uses a co-planar capacitor from the Zero Characters Left blog. The sensing circuit can be constructed for less than $25.00 w/ little or no prior experience in hardware or software prototyping. Experiment with and modify the system to create a version that suits your own needs! Other microcontrollers, like an Arduino, also work. This resistance was the best for my system, but a different resistor value might work better for your own setup. Experiment w/ different value resistors and see what happens! Save the two EAGLE files (schematic and board file), then send to OSHPark. It costs ~ $10.00 for three, yay! Recommended to get stranded wire b/c conducts better & is less likely to break. This is the bare minimum needed to built the system. I recommend that you use better/more permanent connections once you have tested the system and made sure that it all works as expected. A soldering iron is (almost) essential for this project, especially for attaching wire leads to the co-planar capacitor. 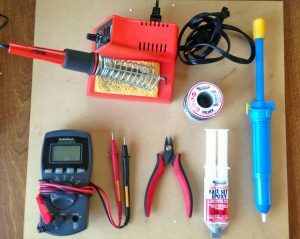 You can purchase a soldering iron, solder and solder wick (removes solder) for ~ $20-30, or find a local makerspace/hackerspace that will let you come in and use an on-site soldering iron. Water conducts electricity better than air. This information allows for tons of different types of soil moisture sensors. This design uses a capacitive sensor: the capacitance of the sensor changes based on the amount of water in the soil. An RC circuit provides a quick & simple way to measure changes in the sensor capacitance due to changes in soil water content. A little bit of jargon: “RC” stands for Resistor – Capacitor. An RC circuit generates a time-varying current depending on the initial voltage, the initial current, and the circuit resistance and circuit capacitance. AKA: the output of the RC circuit depends on how much power you put into it and on the resistors and capacitors in the circuit.. which makes sense as that’s all there is in the circuit! The graph on the right shows how the voltage across the capacitor changes over time. The time constant is used to measure changes in the sensor capacitance. As the capacitance changes, so does the time constant. The equation above tells us that the time constant is directly proportional to capacitance, i.e. the time constant increases as the capacitance increases, and vice versa. In this system, the co-planar capacitor is the soil moisture sensor (or SMS). Theoretically, when the sensor is in air or dry soil, the time constant is small b/c the capacitance is low. 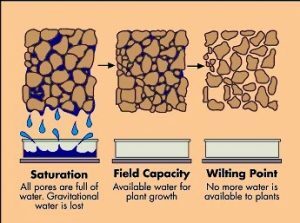 In water or saturated/wet soil, the time constant is larger b/c the capacitance is higher. If you want to boost or lower the signal, change the value of the resistor to increase/decrease the magnitude of the sensor output.An Odd Observation: When the sensor was in dryish/damp soil and not registering, touching the resistor leads caused the sensor to output a reasonable signal. It also was sensitive to changes in light. These phenomena could be due to finicky connections & exposed wires; RC circuits tend to be sensitive to changes. Solder wire leads onto the soil moisture sensor pads. Test connection w/ multimeter. If the sensor is electrically connected, coat in epoxy & let dry before continuing. 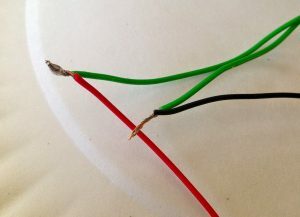 If you’re using stranded wire + a breadboard, you’ll need to find a way to connect the stranded wire to the breadboard (b/c trying to shove it into the breadboard holes will make you want to pull your hair out). I stripped two breadboard wires and soldered them to the sensor leads. My connections were stil a bit finicky. Try different methods and see what works best. Use available materials and keep it simple! For the remaining hardware steps, reference the schematic and the picture below. 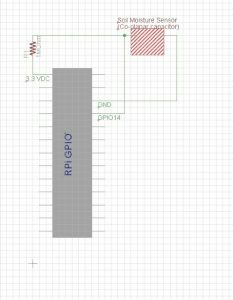 Connect the RPi GPIO pins to the breadboard. Connect the 3.3 V output pin to the “+” column along the side of the breadboard. Connect the GPIO ground pin to the “-” column. Connect one resistor end to the 3.3 V output (any of the holes in the “+” column). Connect the other end to any of the breadboard rows. Orientation of the resistor leads doesn’t matter. Connect GPIO pin 14 to the same breadboard row as the resistor. You can use a different GPIO pin, but remember to change it in the software program. Connect one of the soil moisture sensor leads to the same breadboard row as the resistor + probe. Connect the other lead to ground (any of the holes along the “-” column). It doesn’t matter which lead goes where. 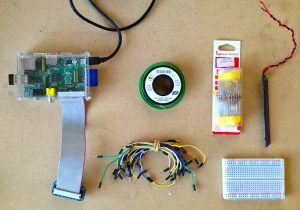 Write a code to measure the capacitance of the sensor! Use the fact that the time constant changes depending on the medium in which the sensor is installed (capacitance is much larger in water than in air). Keep in mind that is a basic program and doesn’t include a GUI. All commands are run on the Pi’s terminal window (LXTerminal). The program prints the raw time constant, which is correlated to soil water content, a time stamp. If the reading is too low, the program also prints a reminder to water the plants. It also stores the raw data in a text file. To end the program, use “Ctrl + Z” or “Ctrl + C”. Modify and improve the program based on your own skills/needs. Remember to change the watering threshold based on your own experimental discoveries! Test the code and determine your ideal threshold. a) Test the sensor in water and air first; this provides the upper and lower bounds on the sensor output. If you find that the sensor is not reading in either of these mediums, change the value of the resistor until you get a reasonable signal. Be sure to record the reading for at least 5 – 10 minutes. It is helpful to plot the results in a program like Excel or R.
b) Place the sensor in a cup of dry soil. Add a small amount of water and measure changes in sensor output over time (wait at least 5 – 10 minutes). c) If you are not getting a reading in either medium, try checking the electrical connections on the sensor. Fix the program as necessary. Your signal will likely be different than mine due to minor differences in your sensor and general setup. Use your findings from 8.a) & b) to find an approximate value at which your soil is too dry. Optional extension of the project: Making it survive outdoors! Coat everything (except the sensor) in epoxy! .. Ok, so maybe not. Although, honestly it might work if you’re careful. 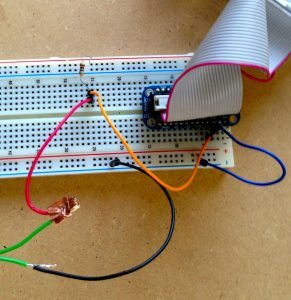 Otherwise, you’ll want to scrap the breadboard for a PCB board + more 22-gauge wire. Molex connectors or something similar are a handy feature for the sensor. Solder the resistor & the sensor leads to the PCB board. Your PCB may have copper lines connecting various pads; use this pattern on the PCB board to your advantage! If your PCB board does not have any pads connected, an easy way to connect components is to run wires along the bottom. Test the system w/ a multimeter or by running the code to be sure that it works as expected. NOW coat it all in epoxy! If you run into any problems or you’re struggling with a particular step, please leave a comment & we can troubleshoot together! And we can help save the world by reducing our personal water consumption, yay! Ah yes, been meaning to fix that. Thanks for reminding me, ha. Updated the schematic so it reflects the correct placement of the GPIO pin. Which metal can we used instead of sensor pads?